A tote-bag, a Samsung Galaxy, a week-long trip to Sochi, visits by Russia’s leading politicians, and a massive conglomeration of Olympic-scale festivities; these are some of the gifts Russian bestowed upon 30,000 young people, including myself, during last month’s World Festival of Youth and Students. Originally an Eastern Bloc festival aimed to connect youth from around the world, this year’s event, hosted for the first time in a refurbished, post-Soviet Russia, has been used to boost the country’s international reputation. Along with the Olympics and the World Cup, the World Festival is an example of Russia using large international events to wield soft power at home and abroad. Having attended the Festival myself, I had the chance to witness the complexity of the tactics used by a resurgent Russia to create a positive image before the world. 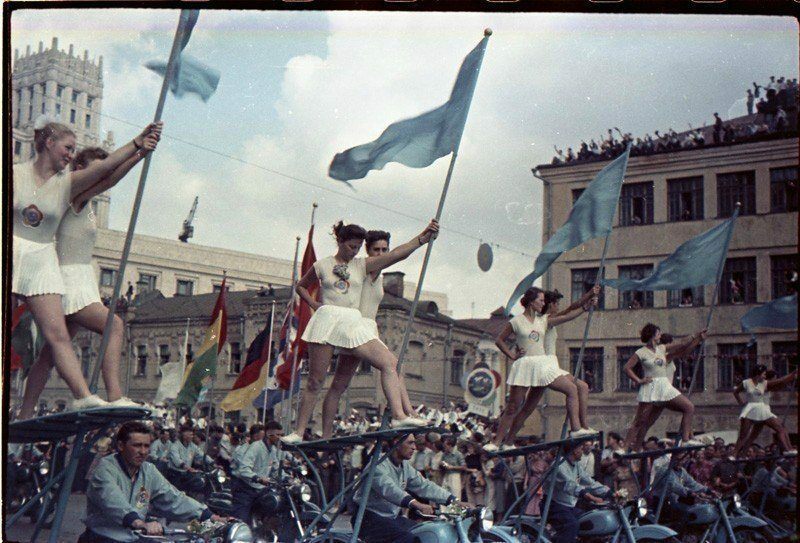 The World Festival of Youth and Students was founded in 1947 as a UN-backed festival meant to promote solidarity among youth from all around the world. After being first hosted in Prague, the Festival was quickly overtaken by Warsaw Pact countries. Since then, hosts have included the likes of East Germany, Cuba, North Korea, and Venezuela. In 1957 and 1985, the USSR had the chance to host the Festival in Moscow, giving it the opportunity to portray itself as an innovative world leader. Moscow intended to be the most grandiose host in the Festival’s history by devoting the entire arsenal of Soviet technology and culture to its success. For example, in the 1957 Festival, a slew of hotels and a new boulevard in the center of the city were built for the occasion. Last month, the World Festival reopened with another grand parade in Moscow. This time it was not on Soviet, but on Russian soil. For the Russian Federation, the Festival was a chance to emphasize its new image as a forward-looking superpower ready to embrace 10,000 foreigners. Given the competitive selection process, many of these foreigners are future leaders in emerging economies; this was Russia’s chance to attract their interest. 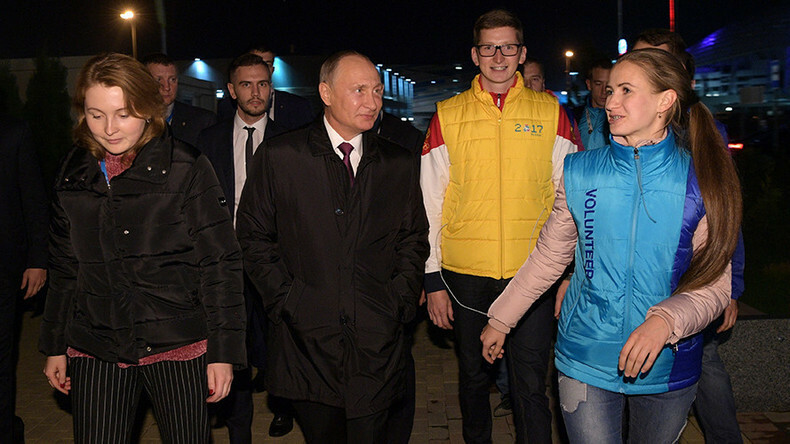 Hence, using the same model as for the Olympics and upcoming World Cup, Russia invested its resources into an elaborate ten-day event in Sochi. According to an article by state news site TASS, the total bill set for the government was 4.5 billion rubles ($76 million). As expected, the Festival was more grandiose than anything I’ve experienced in my life. The confluence of so many nationalities and backgrounds in one place was enough to leave one in awe. It was simply impossible to process all the parades, cultural presentations, concerts, panels, and competitions thrown at us within ten days. It is no surprise that the same “mass euphoria” described in 1957 prevailed among this year’s participants. At the same time, the organizers were visibly determined to put all of Russia’s potential on full display. Besides making use of Sochi’s modern Olympic park and piling us with free souvenirs, the Festival included some of Russia’s most famous figures as speakers, including Foreign Minister Sergey Lavrov, MP Vladimir Zhirinovsky and Sberbank CEO Herman Gref. An air show showcased the country’s military might while performances by opera divas portrayed its cultural heritage. The Festival also showcased the multiethnic and multi-regional nature of the Russian Federation, an identity the country has recently emphasized as it reckons with its imperial past. 1,500 participants, including myself, were carted across 10 Russian cities. These included Vladivostok and Kaliningrad, displaying the country’s geographic span, and Makhachkala and Kazan, which displayed its ethnic plurality. In Sochi, each of its 85 “Federal Subjects” (states) ran a booth to advertise their potential to future investors. Delegates from non-Russian regions like Dagestan, Tatarstan and Buryatia proudly shared their cultural and religious traditions. Such soft power diplomacy was not kept covert. In an article published on a state-run news site, a representative of the President bluntly called the Festival’s participants “a soft power” who would leave the Festival with “no worries” of Russia as a “belligerent country”. Occasional check-ups by the administration corroborated these underpinning motivations. Midway into the Festival, a survey on “perceptions of Russia” was circulated among participants, which included questions on whether we considered Russia a threatening dictatorship. In the middle of an elaborate rock performance during the closing event, a video was presented in which participants admitted their negative preconceptions of Russia as “a dark place … a dangerous country” and subsequently retracted their statements once they visited the country. Behind all these festivities stood one figure: Vladimir Putin. Having stationed his yacht in the nearby Adler port, the Russian President made regular appearances at the festival. Through informal conversations and stadium rallies, his message was clear: you are the leaders of a future world in which Russia will play a prominent role. Along with all the pageantry, the strange and contradictory world of Russia was on full display: Syrians were dancing below a portrait of Assad, North Koreans sold souvenir knick-knacks, and youth organizations representing pro-Russian fighters of Eastern Ukraine wandered around in military uniforms. Russia’s vacillation between democracy and autocracy was also evident. At the same time as government deputies reemphasized state dogma, an independent youth theater group openly called for revolt against the Russian state. Strangest of all was Russia’s grappling with the Festival’s, and hence its own, communist heritage. With the hundredth anniversary of the Bolshevik Revolution this year, Russia has sought to downplay revolutionary fervor for the sake of forging the image of a stable, business-friendly autocracy. And yet the Festival’s communist heritage forced organizers to invite an army of left-wing youth parties from around the world. This contrast was on full display. On one side of the Festival’s exhibition hall was a row of booths distributing far-left, ideological pamphlets. On the other side, Sberbank, Russia’s leading bank, exhibited its hypermodern technology and startup concepts. In Russia, all of these contradictions could somehow work in harmony. As the Festival proceeded in Sochi, it became Russia’s major media sensation of the week. 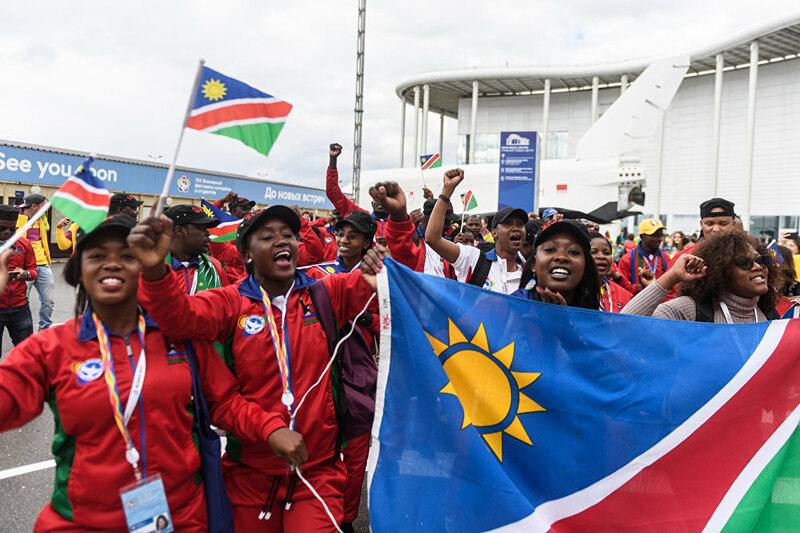 The entire country closely followed its events and programs, from how many participants came from each country to what souvenirs foreigners would be buying. A total of 1,600 journalists from state-run media covered the Festival all across the country, while my fellow participants were elated to see their faces appear on major broadcasting networks. Interviews often featured participants from predominantly non-white countries, who shared how Russia has “great infrastructure” and is “very clean.” On TASS, a major state-run news source, hundreds of articles covered the Festival day-by-day, in no way ashamed of the Festival’s opulence. One article bluntly laid out the resources invested in the grand opening: 1000 organizers, 200 dancers, 500 lights and 1 megawatt of energy. Coverage did not shy away from politicized events. Channel Russia-24, for example, covered a session on fake news during which a foreign ministry spokesperson condemned the US for concocting myths on Russian interference and denigrating its African-American population. The Valdai Club held a publicized session to discuss the policy of “strategic frivolity” implemented in the West, in other words, Donald Trump’s Twitter rants. The Festival also served as an opportunity for the state to hype up its upcoming projects. The director of the Russian Space Agency, Roscosmos, announced the launch of a near-lunar station and the head of Ingushetia, a small Caucasian republic inside of Russia, publicized a major gas deal while visiting the Festival’s venues. An Exercise of Soft Power? The World Festival of Youth and Students is just one of many instances of Russian soft power tactics to improve its profile at home and abroad. Along with the Olympics and World Cup, it is only the surface of a broad campaign of cultural, educational and athletic initiatives with similar goals. On one hand, such a campaign is needed in a world unaware of the diversity and potential among Russia’s youth. Largely cut off from the world due to political tensions, these talented young people certainly deserve the chance to network with foreigners. On the other hand, the image portrayed in Sochi contrasts with the reality of a country that has invested enormous amounts of state funds to portray itself so well. One must ask whether such an investment is justifiable given Russia’s current economic downturn. The air shows, celebrity concerts, nightly parties, and free smartphones can feel excessive. Previous hosts have already been criticized for wasting funds on a “kissing festival” (as coined by an outraged South African public when the Festival was held in Pretoria), and this year’s 76-million-dollar budget far exceeded previous hosts’ investments. This is not the first spending spree of its kind in Russia: the Sochi Olympics were the most expensive Olympics yet, and a slew of new stadiums are already being built for the World Cup. The World Festival of Youth and Students presents an alternative side to Russian soft power. In a time when Russia actively uses disinformation and hacking to its advantage, the Festival is a more peaceful, though equally potent, method of advancing state interests. Its opulence and large budget reveal the extent to which Russia values the Festival. And yet, perhaps this isn’t so bad. Overlooking the pageantry, events like the Festival open a small window into the Russia beyond its belligerent politics. Behind the Putin appearances and free Samsung phones, there are real Russian youth with dreams and potential. These are the real victims or beneficiaries of Russian politics and any chance for them to connect outside of Russia may be worth the exceedingly high price.